There’s plenty to think about when it comes to picking the perfect bridal shoes. The weather, the length of your dress, your venue, and your personal tolerance for four-inch heels! 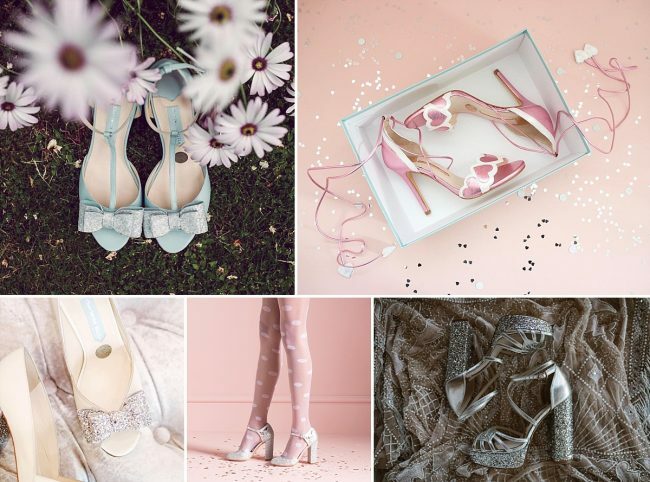 And contrary to what a lot of people think, shoes certainly don’t go unnoticed… your photographer will be keen to capture them, you also might be required to lift your dress to walk up steps or get out of a car or lift your dress hem in case of inclement weather – whatever happens, those shoes will be grabbing attention! 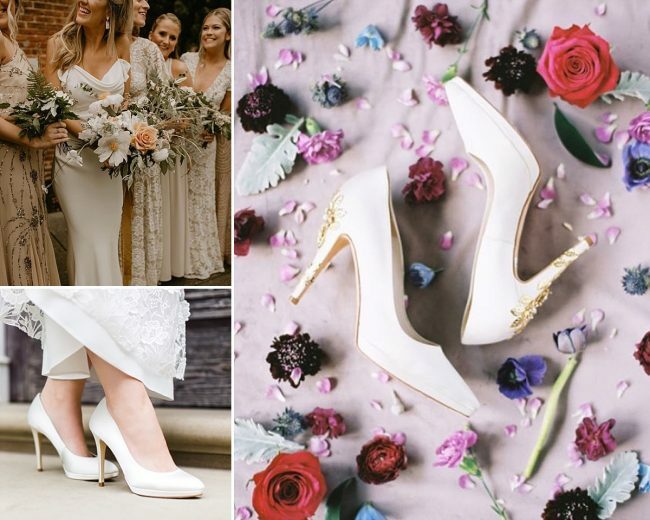 At LOVE, we’re proud to stock a fabulous range of bridal shoes to complement our gowns, with collections from top bridal shoe designers, Charlotte Mills and Harriet Wilde. Charlotte Mills‘ love-heart shoe concept fits perfectly with our LOVE branding. Love hearts provided the inspiration for Charlotte’s debut season and still play a big part in her current collections along with statement heels, glitter and girly details. Her romantic yet fun ethos, together with fashion forward styling is perfect for modern brides. She believes it is important to create shoes which stand out from the crowd and uses a range of laser cutting, appliqué and embroidery, not to mention a refreshing splash of colour options to do just that. Each shoe is hand made in Spain, finished with a silver sixpence in one shoe for good luck on your special day and the leather sole is embossed with the traditional message ‘Something old, something new…’. 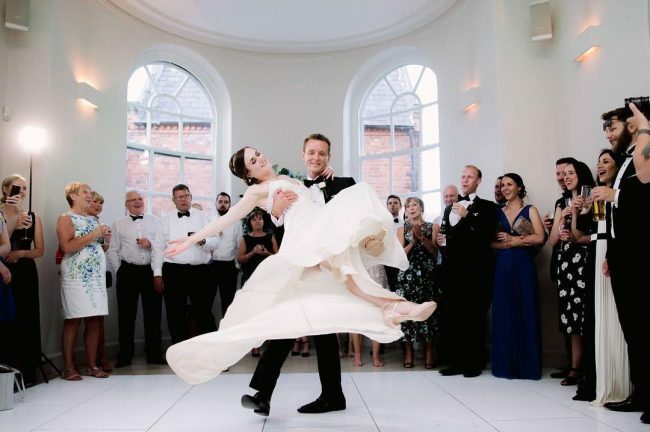 In fact Charlotte Mills are extremely proud that each of their shoes tick off every aspect of this tradition from blue detailing on the insock to a request for them to ‘borrow’ a photo from you of your chosen shoes on the big day – read more in their blog. Harriet Wilde is a British independent footwear label, established in 2008 by designer Ruth Shaw. 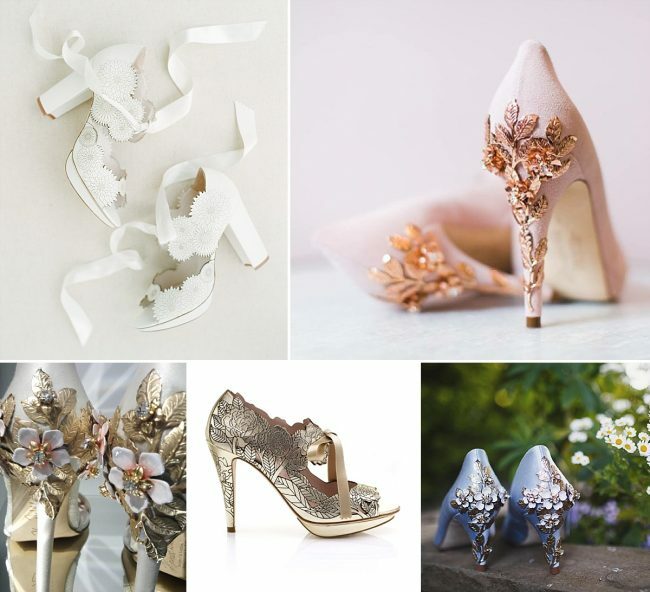 Her bridal footwear collection is distinctive and vintage inspired, and her signature, embellished heels make the most beautiful statement to any bride’s look. Using the most luxurious fabrics including duchess satin, super-soft kid leather, and gorgeous suede, Harriet Wilde shoes are made to the highest quality in Europe. Designed with the bride in mind, her satin shoes can be dyed to any colour and come in a variety of heel heights. This bespoke service guarantees both comfort and style, as well as a unique shoe for a unique bride. There are several reasons why it’s better to choose your wedding dress before you purchase your wedding shoes. Most importantly your shoes should complement your dress, something you will be guessing on unless you can try on a few shoe options. 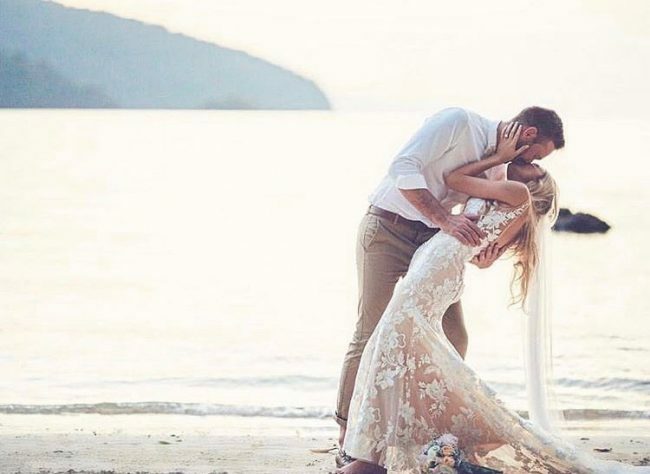 Once you’ve decided on your dress, choosing your shoes becomes your next priority as you’ll need them at each of your dress fittings (which start about 8 weeks before your big day), so our seamstress can make sure your dress is the perfect length. Open toe sandals in December? Four-inch heels on the beach? When and where you have your wedding are important considerations when choosing your perfect shoe. So, in order to avoid a pair of ruined shoes and regret in the morning, it may be better to forgo the embellished, satin, peep toe stiletto if you’re planning a Glastonbury style wedding in a muddy field and opt for something more practical. The chances are, you will be wearing your shoes for around 12 hours on the day of your wedding. So, if they pinch, rub or you can’t walk in them, never mind dance in them, they may not be the right shoe for you. A lower, chunkier heel will take the pressure off the balls of your feet. However, if you’re used to wearing stilettos to the supermarket then go for it, it’s all about what suits you! Our collections from Harriet Wilde and Charlotte Mills come in a variety of heel styles and heights, meaning you don’t have to sacrifice the style of the shoe for the comfort of your feet. Think about making an overall style statement. If you have chosen a heavily beaded gown, then you may want to let the dress do the talking and opt for a simple pair of ivory heels. If you’ve gone for a vintage or retro look, you may want to think about opting for a shoe with similar detailing or a shoe shaped from the same era. Or, if your impeccable taste leads you to choose Made with Love’s beautifully understated Georgie dress, how about pairing it with a pair of Charlotte Mill’s Francesca courts with glitter-block heel? A simple pointed toe which you may just get a glimpse of when you walk due to the fit and style of the gown, but with a wow heel too! An ivory shoe is definitely not obligatory. Both Harriet Wilde and Charlotte Mills design their ranges in a selection of gorgeous colours. Blue can be a popular choice, as this allows brides to incorporate both something new and something blue into their look. We’re also seeing lots of dusky pinks, golds, silvers and much more! 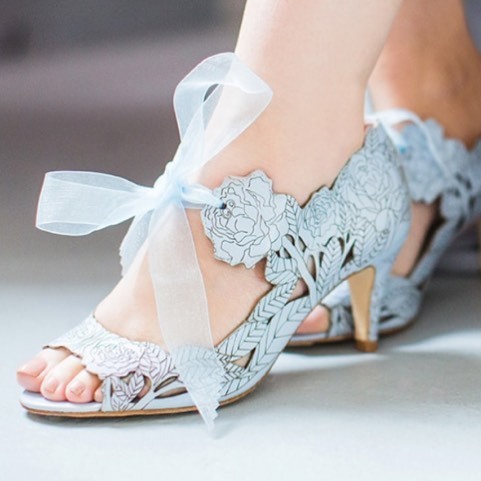 Coloured shoes can be a practical choice as they can be worn long after the wedding is over and will be a lovely reminder of your special day. 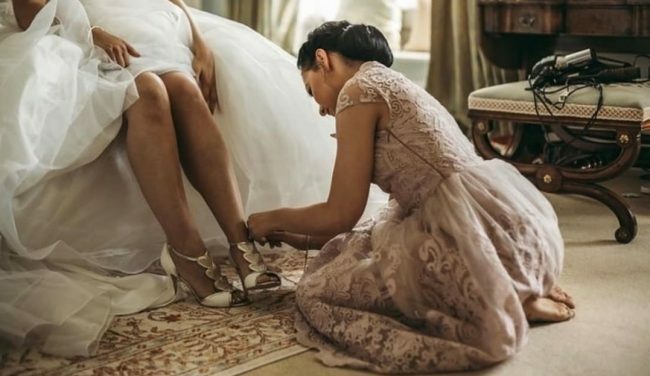 Bride recommendations for shoes are a great place to start; by looking at photos of real brides you can see what kind of shoes they have matched to their venue, whether they’re still dancing in their heels at the end of the night, and what kind of shoes really pop in photos. 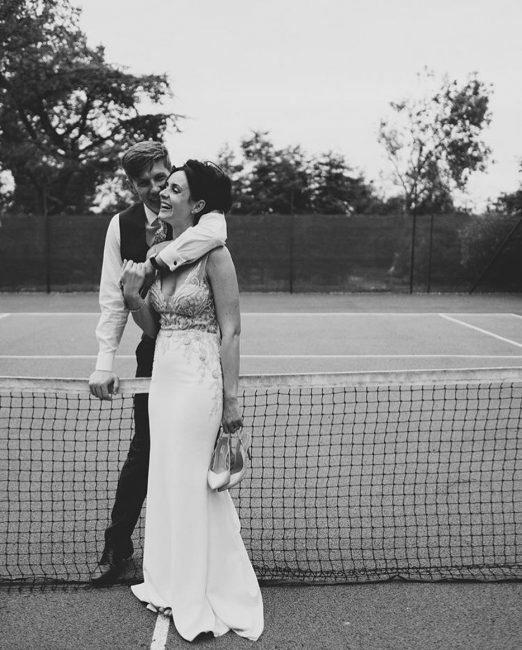 A particular favourite among LOVE brides is Joanie from Harriet Wilde. This shoe has a clever added platform, with a delicate pointed toe, and is available in two heel heights, depending on our brides’ preference. There’s also the option to add the signature Harriet Wilde embellished heel. This shoe looks amazing with all sorts of dress skirt shapes, but a personal favourite is when they’re worn with a slinky silk gown such as the Savannah Miller ‘Chloe’ dress and you can just see a peek of shoe when the bride walks. When considering shoe styles, think about the movement of your dress and how much of your shoe will be seen as you walk. A lot of our brides opt for a closed toe with a more fitted dress style rather than peep toe, so that the shoe will be seen instead of your toes (obviously when fitted correctly your dress should just tickle the floor and you shouldn’t see any shoe as you stand still, but it can then still glide slightly over your shoe as you walk). Perhaps you’ve got a front or back slit on your dress, or a high-low hem so shoe choice will be even more important to you – those Harriet Wilde embellished heels would certainly be the perfect shoe choice for this style of dress! Remember, you’re not limited to just one shoe. It’s your day and you can do whatever you want! 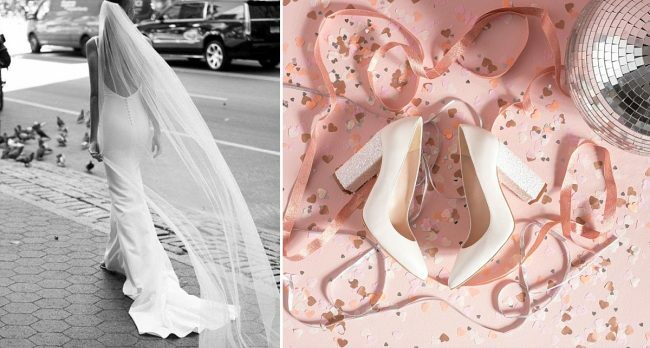 If you’ve fallen in love with a pair of killer heels that will make an amazing statement as you walk down the aisle, but you know they won’t be ideal for dancing in later, then simply change them when you get to the reception. Ballet pumps, sandals or even a pair of super-stylish, embellished trainers would make a stunning style statement. You might need to lift your dress up a little, but by that point you won’t even notice! Charlotte Mill’s, Blossom Pearl, delicate flat sandal with heart details and wrap around ankle tie would make a gorgeous option and allow you to keep dancing until the early hours of the morning – pain free! Whether you go for comfort or style, or a mixture of the two, it’s best to prepare a little before the big day. Try wearing your shoes indoors and on clean, dry, carpeted surface, so they mould to the shape of your feet, perhaps even with a thin pair of socks on too. This will also give you a good idea what comfort inserts you may need. It’s also worth investing in a protective film for the soles of your shoes to reduce the amount of damage done on the day. Don’t forget to treat your feet and add a pedicure to your pre-wedding treatment list – you’ll want to feel and look your best from head to toe on your big day! A stunning pair of wedding shoes will be perfectly accessorised with soft skin, neat cuticles and glossy nails. 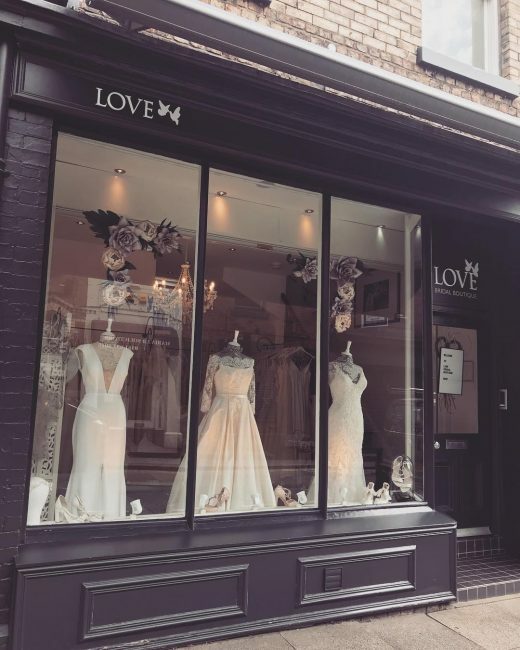 We offer exclusive accessory appointments for any brides who have bought their dress with us, which includes veils, stoles, belts, jewellery, headwear and garters as well as shoes, at LOVE, where our talented stylists will talk you through our full collection. Contact us on 0161 941 6446 or hello@lovebridalboutique.co.uk to find out more. *NEWS FLASH* Stunning accessories event coming soon to LOVE! Email hello@lovebridalboutique.co.uk to reserve your place – it’s the perfect opportunity to see all the gorgeous shoes (and more!) we have to offer.